If you've kept up with the season over at 3-D Theatricals you've probably noticed they've been planning on doing… “A Show that Sets the Bar.” Y0u might be wondering – WHAT THE HECK IS THAT? Well… if you know your musicals, like we do, you'll recognize the color, the fact that it's talking about the “bar” meaning legal bar, and the dog! 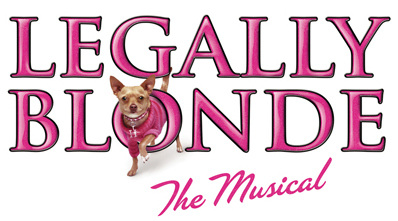 So… we've known they've meant Legally Blonde, but they most likely couldn't announce it because of issues with the rights to the show. They recently made an announcement that they are in fact doing Legally Blonde and they've posted auditions. Below, I've reposted some of the info from their event on Facebook. Click here to see the full listing. Are you going to audition? We'd love to help you prepare! Let us know if you have any questions. **Non union performers auditioning for a principal role or a chorus singer that would like to try to be seen will be seen time permitting. We always make every effort to see everyone, but must see the AEA members and EMC members that have checked in first. We encourage non-union performers auditioning for ensemble roles to attend the ECC Dance Call. Please sing 16 bars of something that shows off your range in the style of the show. Bring sheet music in correct key. Score will be provided if singing from the show. Accompanist will be provided. NO acapella. For the dance call, please bring comfortable dance shoes and wear form fitting clothing. Ladies, please also bring heels to dance in. Be prepared to sing a short selection in the style of the show that shows off your range.